In the 5th century BC Herodotus wrote of Egypt that 'nowhere are there so many marvellous things...nor in the world besides are to be seen so many things of unspeakable greatness' - and not too much has changed. The Sphinx, the Nile, ancient Luxor, the pyramids - Egypt's scope is glorious. It's not just the Pharaonic monuments that have drawn travellers to this country since long before the birth of Christ - it's the legacy of the Greeks, Romans and early Christians, and the profusion of art and architecture accumulated from centuries of successive Islamic dynasties. 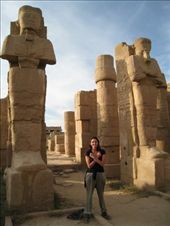 Posing with the Pharaohs at Karnak Temple.